Disbanded 1973 – Family: A rock band far far ahead of it’s time. A blues-based band with art-rock inclinations, Family was one of the more interesting groups of hippie-era Britain. Fronted by the deft and frequently excellent guitar playing of John "Charlie" Whitney and the raspy, whisky-and-cigarette voice of Roger Chapman, Family was much loved in England and Europe but barely achieved cult status in America. 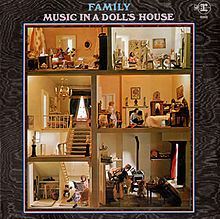 While bands like Jethro Tull, Ten Years After, and the Keith Emerson-led Nice (and later Emerson, Lake, and Palmer) sold lots of records, Family, which frequently toured with these bands, was left in the shadows, an odd band loved by a small but rabid group of fans.